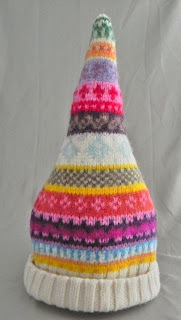 I finished up a couple more upcycled sweater hats over the weekend! I’m not really a pink person, but this pink stripe really spoke to me. I think it would be perfect for Valentine’s Day or spring pictures in a garden. I made 2 hats out of it. The first is a 0-6 month size, and the second is an 18 month to 5 year old size. The stretchy ribbing around the bottom really allows for a great amount of stretch for longer wear. 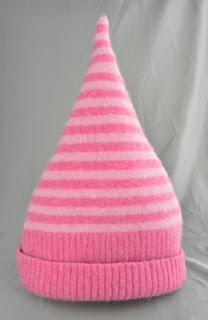 This is the same type of sweater that Little Bit’s green pointy hat was made from. He’s been wearing it since April, and will have another couple of years wear out of it! 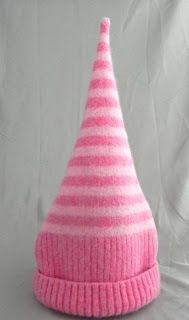 This entry was posted in baby, hats, holidays, refashion, sewing, sweater, toddler, up-cycle. Bookmark the permalink. 1 Response to More Pointy Hats!